• Walk your dog on a grassy areas or in the morning before the concrete/asphalt heats up. • Make sure your dog has access to cool water all day, both inside and out. Most dogs love running, playing fetch, and interacting with other dogs, and a trip to the beach can be a perfect opportunity for your dog to do those things. However, exercise causes increased water loss through muscle contraction, respiration, and evaporation from the skin. Your dog needs to replace that lost water; exercise will leave him with an urge to drink. If you don't provide fresh water often at the beach, your dog will drink salt water. 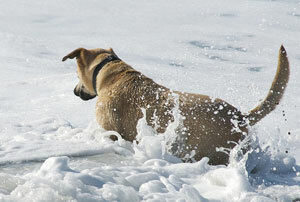 Salt water has an osmotic effect, pulling liquid into your dog's intestines. This can cause diarrhea, which contributes to dehydration. If your dog drinks too much salt water too fast, he could vomit, leading to further dehydration. Even if your dog doesn't actually drink salt water, he can ingest small amounts by handling salt-water-soaked balls and toys or by swimming in salt water. • Remember that hot sand will be hot on your dog's pads, too. "Their pads are just as sensitive as your feet," said Sybil Soukup, executive director of the Humane Society of North Iowa. Hot sand can burn your dog's pads. • Also, when taking your dog for a walk, make sure to have water with you. "If you want a water bottle, so does he," LaCoste said.